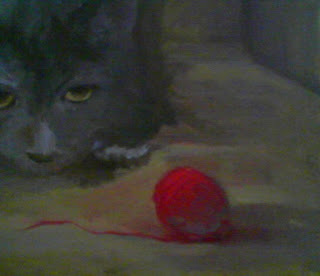 Had to quickly post a photo of this painting; as a friend asked to see how I have worked the ball of yarn. I promise to work smartly, and try to use my digital camera in the future, as some of you have suggested. I know...these cell phone photos are pretty bad. Willow is in one of her dream-scapes. The walls have become a tangle of bamboo, and she watches carefully for a sign of movement, in this dank root zone of baseboard and floor. The chair legs are mere hollowed out stumps of trees that support an odd canopy of low-slung dead branches. It is here, that one can hide in the shadows. She waits patiently, as the moon rises, and illuminates one side of the rarely seen red beetle, as it emerges from it's loamy sleep. Shall it be supper, or a precious gift to the creature who walks on two legs? As I peer into Willow's eyes, I can see the subtle changes in her expression. She appears to suspend reality, as she morphs into one of her many characters that appear in her "dream scapes". Who is she this time? A famous actor in a Kabuki play, striking a dramatic pose before his audience? An Austrialian archeologist, who is teasing away the last bit of sand, that exposes a previously undiscovered beetle? I marvel at her intense concentration. I don't know that I can even describe what I see. She appears to focus the very center of her being, on one molecule that occupies space and time. Like sunlight through the lense of a magnifying glass, on a piece of paper - so powerful is the concentration, that one might expect the object of her attention, to burst into flames. Can it be, that cats meditate? There are such times, when I am painting - and my breathing is slow...and deep. And my mind is centered on the emulsion of paint and oil, as it travels across the warp and weave of the stretched linen. I feel as if I have crossed over to another state of being. And I feel as if I am floating in/connected to - a whole other life force. This happened, for the first time, about 3 weeks ago. I was at once - a little unnerved, but thrilled. Time passed - effortlessly. I felt no pangs of hunger for food or distraction. As I said, a little unnerving, but thrilling. Could this be what Mark Rothko described as, painting the emotion conveyed by a particular subject? If so, it is not surprising that the artist transcends to some other realm, beyond the subject of what one is painting. I am intriuged with Piet Mondrian's (b. 1871 - d. 1944) influence on Rothko (b. 1903 - d. 1970). Take a look at the evolution of Mondrian's paintings. I lament the fact that attention is not typically given to his early impressionistic landscapes, as is to - let's say, Composition with Red, Yellow and Blue (1921). It is quite stunning, to see Piet Mondrian's range of work over a life time. Only then, was I able to fully appreciate how his work evolved into a Modernist form, and perhaps more important - the "why" of it. "Rothko's work becoming increasingly abstract; perhaps ironically, Rothko himself described the process as being one toward "clarity". Rothko's description of this "clarity", is evocative of Piet Mondrian's evolution from impressionist landscapes to a modernist approach. One can see a similar evolution in Mark Rothko's work, from impressionist portraits, street scenes and landscapes, to his use of "mythology and symbols", and finally to what is referred to as "abstraction". *snip* "We favor the simple expression of the complex thought. We are for the large shape because it has the impact of the unequivocal. We wish to reassert the picture plane. We are for flat forms because they destroy illusion and reveal truth." Clarity. Conveying the emotion of the composition. Can it be, that the ultimate resolution of this endeavor, is not - cannot be representational work, but rather, an abstraction? © 2007 M. Sonoqui Gillette. All rights reserved.